Today's post is about (some) of the blue varnishes I've got in my stash. It is a -somehow- comparison post because some are dupes or dupe-ish. About the application: I didn't had any problems with the application of those. 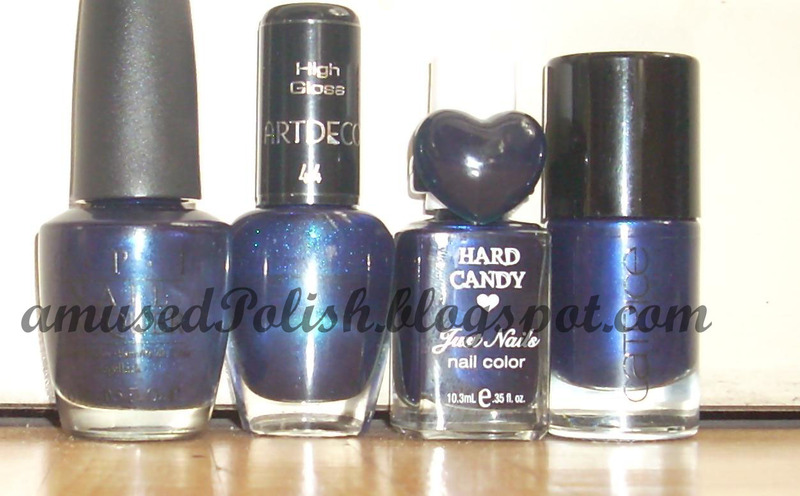 I liked the brush of the Catrice and OPI one best because they were wider. The opacity: Only the Artdeco and Mr. Right needed a second coat- the rest were one-coaters(even though I can see a visible nail line in some parts of my pointer(painted with opi). You can see in the pics that Mr. Right is the darkest amongst them; OPI,Artdeco and Catrice are quite dupe-ish and I think the next time I need to try it with 2 coats of the opi one. Catrice was only a tad lighter. below: with flash; I love the Hard Candy ring! I love blues! These colors are great, I'm working on a blue post as well, and I have a ton of dupe-ish colors! LOL! Which one if these do you recommend the most?